HawkHack at Montclair State University drew hundreds of coders for a 24-hour coding marathon. Photo courtesy of MSU. HawkHack – a 24-hour coding marathon in which computer programmers, graphic designers and project managers collaborated on software projects – recently drew 200 people to Montclair State University and helped cement the institution’s reputation as an innovative tech leader. 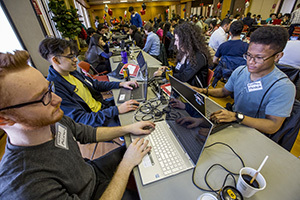 The March 30 hackathon was designed to build up the IT community both on and off campus by bringing people together, enabling innovation and driving competition through the creation of new computer programs. The event, organized by the university’s computer club and its faculty adviser Dawei Li, also provided a great networking opportunity. Representatives of Google, UPS and Netflix were on hand to answer questions, conduct workshops and meet prospective interns. Laser gun and cup stacking competitions also helped to keep the mood upbeat for anyone needing a break from the screen. HawkHack is just one of the many ways Montclair State is cementing its reputation as a regional leader in computer science programs and innovative technology. This semester the university announced three new master’s degrees in Information Technology. The Master of Science in Cybersecurity will enroll its first students in fall 2019, answering an increasing demand for skilled workers in the field. Research shows that there will be as many as 3.5 million unfilled cybersecurity-related positions by 2021, a critical shortfall that could threaten not just our identities and personal information, but our nation’s infrastructure and economy. The Master of Science in Computational Linguistics, which will also launch in the fall of 2019 pending state approval, is a two-year program focused on helping machines process human language and helping linguists understand language through computer models. Computational linguistics is considered one of the most commercially viable branches of the field, with major tech companies such as Apple, Facebook, Intel and Microsoft all hiring.